I am back with another NOTW!.. I know I missed last weeks notw.. but I actually kept my Pink Medallion nails for an extra week =).. So here i am with pink disco.. yes, yes i know.. another pink notw.. but if you haven't guessed by now.. i love pink nail polishes.. especially the subtle creme ones, also with valentines day coming up I did not want to do anything crazy so i thought a subtle pink would do. So I did my nails sunday night right before going to bed.. that same day i was at walgreens and came across a beautiful wet n' wild pink glitter polish.. it was only .99cents!! It was also the last one.. just sitting there taunting me.. so i had to grab it! I hope you guys enjoyed what i came up with for this week.. since valentines day is next week.. i will probably keep my nails this way and just add some nail art (hearts) to my nails. I guess its kind of like recycling a notw.. This is sooo cute! I am obsessed with nail art! The pink Essie color almost looks matte. Very pretty NOTW! Lovely polish color!!! I'm so glad to have found your blog! I really enjoy reading your posts! If you have a chance, please visit/follow my fashion blog. Your supports will mean the world to me!!! Thank you so much in advance!!! Have a great day!!! 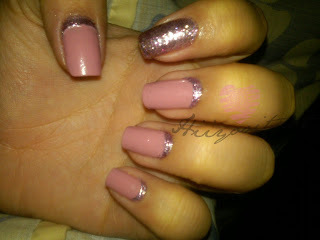 i love your nails :) the pink with the sparkles (and both are my favorites!) are so beautiful together. i also love how you painted one nail in the wet n wild and all the others in pink :) very creative!